Mercedes-Benz Forum > Mercedes-Benz Enthusiasts Forums > DIY/Tech Help > 2015 ml350 rear calipers help!! 2015 ml350 rear calipers help!! but not sure. I went to my local dealer to get help but they told me to put it together the wrong way so when I was bleeding the brakes, oil must have got through to the electric brakes and popped the cover off the electric brake housing. 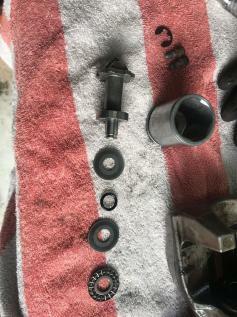 Now I have a mess so any help on how to put it back together would be great.